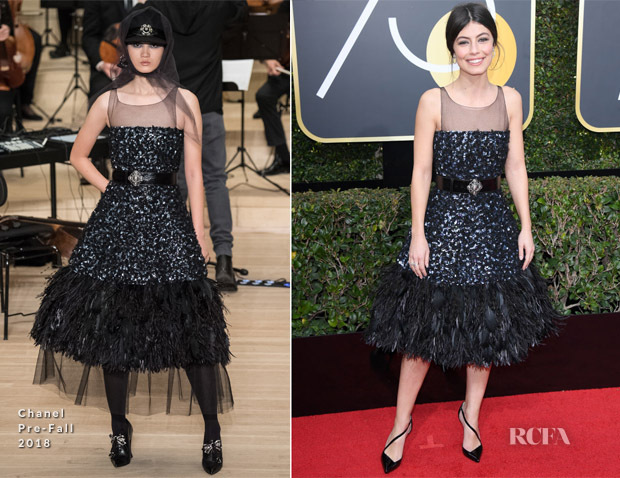 “Master of None” star Alessandra Masteroni arrived on the Globes Red Carpet wearing Chanel Pre-Fall 2018. Chanel designs are known for their whimsical style. Even in this dark hue, Alessandra looked feminine and elegant in a tea length feathered black sequin gown. While the runway version catered to a couture crowd, featuring a high fashion headpiece and pumps with tights, the actress was able to make this look wearable by pairing down her accessories. With a middle-parted sleek updo, the Chanel look was perfect for the red carpet. Sticking to a pointy heel with simple detail let the dress do the all the talking, which is ideal for such a statement design. Her decision to keep the waist cinched in accentuated her petite figure and kept true to the runway styling. Chanel Fine Jewelry added a touch of sparkle to the look.